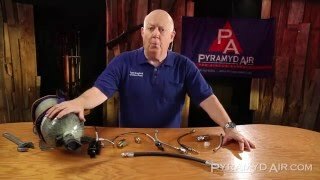 With this exclusive Pyramyd Air kit, you can be range ready right out of the box! Each kit includes 3 magazines, a single-shot tray (.177 and .22 only) and a huge UTG 4-16x40 scope with rings, and H&N Pellets. 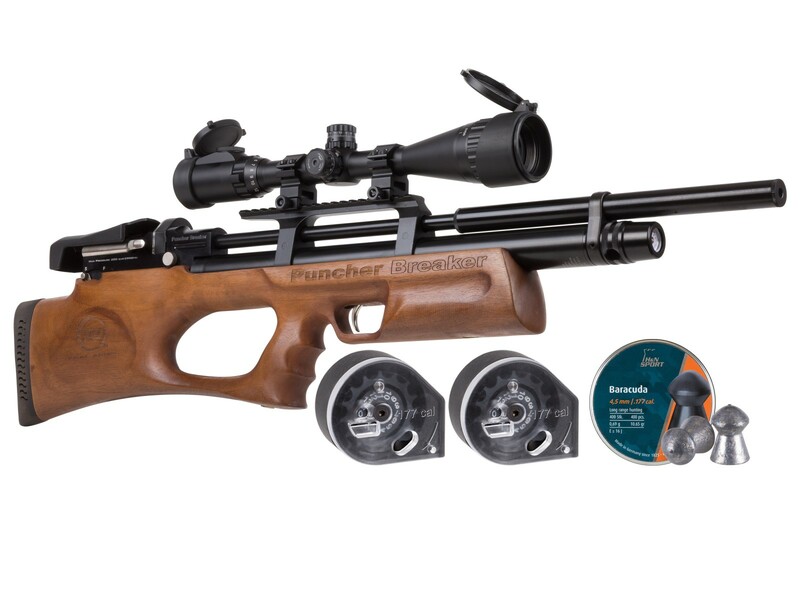 The Puncher Breaker maintains the knockdown energy and surgical accuracy of the Puncher PCP rifles in a more maneuverable and lightweight package. This variant features a laser-etched Turkish walnut stock with complete with a bipod adapter for the included 2.5” Weaver rail. The 7.5'' Weaver scope rail gives you plenty of room to get the proper eye relief with your new UTG scope. Each Breaker includes an adjustable power wheel to find your perfect balance between powerful hunting shots and long target shooting shot strings. Likewise, the 2-stage adjustable trigger is adjustable to set your shots to your preferred trigger pull. With a large 280cc cylinder and a 200 BAR (2,900 psi) fill pressure, you'll certainly get your money's worth on shot count that you can use the nickel sidelever to keep snapping rounds into the breach. A half-shrouded barrel significantly reduces the sound of the shots and is excellent for backyard target practice and pest removal. If you want an all in one Kral Puncher Breaker setup, do not miss this exclusive package! Things I liked: This is my first PCP air rifle and purchasing the Pyramid Air kit made things allot easier. The UTG scope is a good match for this rifle. Accuracy is spot on with the included H&N Target Trophy 14.66gr and separately purchased JSB Diabolo Heavy 18.1gr. I love the compactness of this rifle as I live in town and can be more discreet with the dispatching of squirrels in my yard. Things I would have changed: With this being my first PCP I don't know of anything I would change as I have no issues with anything as of yet. Other reviews mention it being a little loud so I will probably add a Quiet Kit from Annihilator although it doesn't seem very loud to me. What others should know: The walnut stock does come unfinished which I like so the new owner can finish it the way they like it. I wet sanded two coats of boiled linseed oil with a 400 medium sandpaper and hard rubbed a third coat into the grain and topped it off with gun wax. The stock is smooth and feels good in the hands, I will post a couple of pictures with the finished stock. Another thing that reviewers mentioned is it is heavy and it did feel heavy a first but once you shoulder it you don't feel the weight and honestly now that I'm used to it I don't notice it's weight. Things I liked: Great rifle exactly what I wanted. Things I would have changed: Stock needed to be sanded and oiled, to bring out its Turkish Walnut shine. Can a regulator be put onto this model? What would it cost? I believe there is one available from Robert Lane in the UK, PA does not sell it.